"Climatism or global warming alarmism is the most prominent recent example of science being co-opted to serve a political agenda", writes Richard Lindzen of the Massachusetts Institute of Technology in the fall 2013 issue of the Journal of American Physicians and Surgeons. Lindzen claims that ambiguous statements by scientists are translated into alarmist statements by media and advocacy groups, influencing politicians to feed more money to the acquiescent scientists. Actually it’s official. The scare is over. The World Federation of Scientists, at its annual seminars on planetary emergencies, has been advised by its own climate monitoring panel that global warming is no longer a planetary emergency. But NZ is well behind. Perfectly exemplifing Lindzen's claim, in the NZ media barely last week there was an excited shriek by ex-NIWA boss Dr Jim Salinger that we have had our warmest-ever winter. Never mind that what farmers call winter is quite different to the call from Metservice and NIWA. Unless a climate scientist wrings his/her hands about global warming/climate change they face financial ruin. In continuing desperation to find even the smallest global warming evidence, the regular forecasters' outlooks focus on mild spells and downplay icy events. Farmers tend to bask in but distrust mild spells in winter and instead keep a lookout for deep polar blasts from the south and southwest because that can bring their financial ruin. So Houston we have a problem. In the upper North Island winter typically begins when pasture growth slows enough to dry off your cows, and ends when milking again resumes. “Winter” can then be anytime between April and September. In the Hokianga there is a saying that the year has only two seasons, wet and wetter. It reflects the warmth of the Northland climate, which anywhere away from the HokiangaRiver is fondly called the sunny north. This is with good reason because Northland shares the same latitude as Victoria. But it is not nearly the same for South Island farmers at the same latitude as southern Tasmania, and whose winter typically begins with the first polar blasts bringing snowfalls. Winter finishes with the thaws that come with rising temperatures. This can be anytime between April and October and need not, for practical purposes, have any resemblance to what is happening in the North Island. This winter was always going to be a mild one in the North island (see p287 of this year's almanac). But southern regions would face icy wintry spells and polar blasts. Although August has now ended there is a lot more winter to come, and danger to lambing. That trend is clear given the past couple of years of lamb fatalities in September and/or October. To give legitimacy to the media report about the so-called warmth of the winter, Dr Salinger claims “there has been an absence of cold snaps in recent months”. "Heavy snow inland to low levels along with bitterly cold wind chills produced by severe gales..polar blast storm, lashed the country causing $33 million of damage. "Surge of southerly air brings widespread heavy frosts"
"White-out conditions with snow to 700m have closed the Desert Rd in the central NorthIsland and eastern regions are experiencing some of the coldest weather of the year. "A cold snap is racing up the country today and will bring wintry conditions to both islands." "in Australia, strong cold front brings snow"
In NZ "Winter is in full swing with another cold snap on the way, following flooding and wintry conditions which caused problems for drivers". "An active and fast moving cold front is today flying across the Tasman Sea and will hit the western coastline of New Zealand early this evening bringing the potential for severe weather. "Southerly change across NZ...snow to inland areas of South Island..change to a cooler air flow. Does the above sound like the warmest winter ever to anyone? It is an example of what Lindzen claims, that instead of nature itself, science prefers to regard computer models as the reality, which is more politically and financially rewarding. The reading public do not know anything is amiss. If a scientist has qualifications he/she is assumed to be an expert. When even the Chief Science Advisor also goes public with falsehoods about climate, a person the public trusts as much as the Ombudsman, this generates serious distrust in science. I am sure we have all felt the winter cold; now we have a cool September and a cold October to get through before a shift to warmer December weather. Yes there are some flowers and blossoms visible right now, but the species photographed every September for newspapers’ front pages actually respond to strength of light which is fixed by month (around end of August) and not by temperature. Happily this winter has been fantastic for ski operators because all skifields are lush with snow. That alone should demonstrate that the season has not been too over-warm. The smallest child will know that snow comes in colder weather and thaws when temperatures rise. Winters can have both warm and cold spells but a good snow-base would not be capable of hanging around throughout any “warmest season ever”. 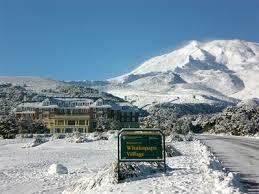 Doubters can drive along the Desert Rd and look at the white global warming lying on Ruapehu.